Key signature A major / F♯ minor with three sharps placed after the clef. In musical notation, a key signature is a series of sharp or flat symbols placed on the staff, designating notes that are to be consistently played one semitone higher or lower than the equivalent natural notes unless otherwise altered with an accidental. Key signatures are generally written immediately after the clef at the beginning of a line of musical notation, although they can appear in other parts of a score, notably after a double bar. Key signatures are generally used in a score to avoid the complication of having sharp or flat symbols on every instance of certain notes. Each major and minor key has an associated key signature that sharpens or flattens the notes which are used in its scale. However, it is not uncommon for a piece to be written with a key signature that does not match its key, for example, in some Baroque pieces, or in transcriptions of traditional modal folk tunes. In principle, any piece can be written with any key signature, using accidentals to correct any notes where it shouldn't apply. The purpose of the key signature is to minimize the number of such accidentals required to notate the music. The sequence of sharps or flats in key signatures is generally rigid in music from the common practice period. For example, if a key signature has only one sharp, it must be an F sharp. The effect of a key signature continues throughout a piece or movement, unless explicitly cancelled by another key signature. For example, if a five-sharp key signature is placed at the beginning of a piece, every A in the piece in any octave will be played as A sharp, unless preceded by an accidental (for instance, the A in the above scale — the next-to-last note — is played as an A♯ even though the A♯ in the key signature is written an octave lower). The convention for the notation of key signatures follows the circle of fifths. 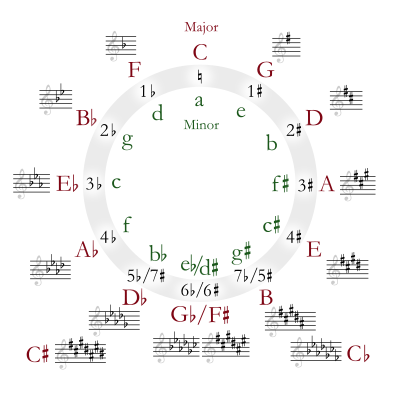 Starting from C major (or equivalently A minor) which has no sharps or flats, successively raising the key by a fifth adds a sharp, going clockwise round the circle of fifths. The new sharp is placed on the new key's leading note (seventh degree) for major keys or supertonic (second degree) for minor keys. Thus G major (E minor) has one sharp which is on the F; then D major (B minor) has two sharps (on F and C) and so on. Similarly successively lowering the key by fifth adds a flat, going counter-clockwise round the circle of fifths. The new flat is placed on the subdominant (fourth degree) for major keys or submediant (sixth degree) for minor keys. Thus F major (D minor) has one flat which is on the B; then B♭ major (G minor) has two flats (on B and E) and so on. Put another way: for key signatures with sharps, the first sharp is placed on F line with subsequent sharps on C, G, D, A, E and B; for key signatures with flats, the first flat is placed on B with subsequent flats on E, A, D, G, C and F. There are thus 15 conventional key signatures, with up to seven sharps or flats and including the empty signature of C major (A minor). The key signatures with seven flats and seven sharps are rarely used because they have simpler enharmonic equivalents. For example, the key of C♯ major (seven sharps) is more simply represented as D♭ major (five flats). For modern practical purposes these keys are (in twelve tone equal temperament) the same, because C♯ and D♭ are enharmonically the same note. Pieces are written in these extreme sharp or flat keys, however: for example, Bach's Prelude and Fugue No. 3 from Book 1 of The Well-Tempered Clavier BWV 848 is in C♯ major. The modern musical Seussical by Flaherty and Ahrens also has several songs written in these extreme keys. "Flat key signatures" consist of one to seven flats, applied as: B E A D G C F (same as the order of sharps, but reversed.) The mnemonic device is then reversed for use in the flat keys: "Battle Ends And Down Goes Charles' Father". The major scale with one flat is F major. In all other "flat major scales", the tonic or key note of a piece in a major key is four notes below the last flat, which is the same as the second-to-last flat in the signature. In the major key with four flats (B♭ E♭ A♭ D♭), for example, the penultimate flat is A♭, indicating a key of A♭ major. A key signature is not the same as a key; key signatures are merely notational devices. They are convenient principally for diatonic or tonal music. Some pieces that change key (modulate) insert a new key signature on the staff partway, while others use accidentals: natural signs to neutralize the key signature and other sharps or flats for the new key. For a given musical mode the key signature defines the diatonic scale that a piece of music uses. Most scales require that some notes be consistently sharped or flatted. For example, the only sharp in the G major scale is F sharp, so the key signature associated with the G major key is the one-sharp key signature. However, the connection is not absolute; a piece with a one-sharp key signature is not necessarily in the key of G major, and likewise, a piece in G major may not always be written with a one-sharp key signature. This is particularly true of minor keys. Keys which are associated with the same key signature are called relative keys. The Dorian Toccata and Fugue in D minor, BWV 538 by Bach has no key signature, which accords with its Dorian mode status (empty signature on D) in preference to its minor key status (which would have a single B♭ signature). The B♭s that occurs in the piece are written with accidentals. Exceptions to common practice period use may be found in Klezmer scales, such as Freygish (Phrygian). In the 20th century, composers such as Bartók and Rzewski (see below) began experimenting with unusual key signatures that departed from the standard order. In 15th-century scores, partial signatures are quite common, in which different voices will have different key signatures; however, this is derived from the different hexachords in which the parts were implicitly written, and the use of the term key signature can be misleading for music of this and earlier periods. Because of the limitations of the traditional highland bagpipe scale, key signatures are often omitted from written pipe music, which otherwise would be written with two sharps, the usual F♯ and C♯. Variant key signatures in a Victoria motet. In the Superius part the E-flat appears first, and in two other parts a flat occurs in two octaves. The above key signatures only express diatonic scales and are therefore sometimes called standard key signatures. Other scales are written either with a standard key signature and use accidentals as required, or with a non-standard key signature. Examples of the latter include the E♭ (right hand) and F♭ & G♭ (left hand) used for the E♭ diminished (E♭ octatonic) scale in Bartók's Crossed Hands (no. 99, vol. 4, Mikrokosmos), or the B♭, E♭ & F♯ used for the D Phrygian dominant scale in Frederic Rzewski's God to a Hungry Child. The absence of a key signature does not always mean that the music is in the key of C major / A minor as each accidental may be notated explicitly as required, or the piece may be modal or atonal. The common practice period conventions are so firmly established that some musical notation programs are unable to show other key signatures. ^ Cooper, David. The Petrie Collection of the Ancient Music of Ireland. Cork: Cork University Press, 2005. p. 22. "In a few cases Petrie has given what is clearly a modal melody a key signature which suggests that it is actally in a minor key. For example, Banish Misfortune is presented in D minor, although it is clearly in the Dorian mode." ^ a b c Schonbrun, Marc (2005). The Everything Music Theory Book, p.68. ISBN 1593376529. ^ a b c Jones, George Thaddeus. 1974. Music Theory: The Fundamental Concepts of Tonal Music Including Notation, Terminology, and Harmony, p.35. Barnes & Noble Outline Series 137. New York, Hagerstown, San Francisco, London: Barnes & Noble. ISBN 978-0-06-40137-4. ^ a b Kennedy, Michael. 1994. "Key-Signature". Oxford Dictionary of Music, second edition, associate editor, Joyce Bourne. Oxford and New York: Oxford University Press. ISBN 0198691629. ^ Nienhuys, Han-Wen; Nieuwenhuizen, Jan (2009). "GNU LilyPond — Notation Reference". 2.6.2 Bagpipes. http://lilypond.org/doc/v2.12/Documentation/user/lilypond/Bagpipes#Bagpipes. Retrieved 2010-03-28. "Bagpipe music nominally uses the key of D Major (even though that isn’t really true). However, since that is the only key that can be used, the key signature is normally not written out." This article is licensed under the GNU Free Documentation License. It uses material from the Wikipedia article "Key signature". Allthough most Wikipedia articles provide accurate information accuracy can not be guaranteed.